Where: Dignity Health Sports Park, Carson, Ca. If you don’t mind staying up a bit late, Saturday’s match between Philadelphia Union and L.A. Galaxy will be one worth watching. The 10:30 pm matchup sees two of the hottest teams in MLS face off. Both the Union and the Galaxy have won their last three matches, and both squads seem only to be improving with time. 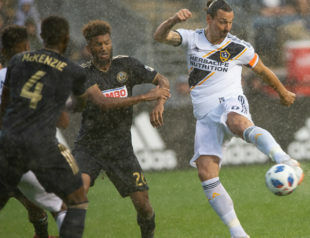 Jim Curtin’s men continue to adapt to his new system, while the Galaxy have rallied behind Zlatan Ibrahimovic, perhaps the best player in MLS behind Carlos Vela. Some may call it a classic tactics versus talent matchup. We’ll call it just plain good soccer. …okay, I can’t do it. The Galaxy are Zlatan, and Zlatan is the Galaxy. Without their star forward, L.A. likely would not find themselves on such a hot streak, competing for the top of the Western Conference table. Tied for third in MLS for goals scored, the Swede has scored in every match in which he has played. Not to mention, the Galaxy have yet to lose this season when Zlatan takes the pitch. The Union’s defense has been stingy, but their backline has not been immune to giving up dangerous opportunities in the box. Needless to say, any time Zlatan gets the ball in front of net, it’s a dangerous opportunity. It also needs to be mentioned that L.A. Galaxy’s defense has been performing quite well of late, shutting out Vancouver Whitecaps away in their last match and conceding 1.2 goals per match. The club recently signed veteran center back and Costa Rican national player Giancarlo Gonzalez from Serie A side Bologna. It’s unlikely that Gonzalez will play, but regardless, the Union have a tough task ahead of them. It will be interesting to see how Jim Curtin comes off his best tactical match as Union head coach against FC Dallas to take on the Galaxy. A large part of his task, of course, will be stopping Zlatan — if that’s possible. The problem is how to do that. As is often the case with this Union team, the answer is in pressing. Brenden Aaronson and Alejandro Bedoya will need to get in the face of the Galaxy’s backline when they have the ball, forcing the ball wide. Zlatan may make a run deep, but if the Galaxy can’t get the ball to him, it doesn’t matter. Further back, Kai Wagner and Ray Gaddis will have their work cut out for them on the wings, making sure that the ball is contained wide, rather than distributed into the middle. In short, the Union defense will need to stop Zlatan by making sure he doesn’t get the ball. On offense, the Union will need to transition quickly if they want to break down the Galaxy’s backline. As mentioned, L.A. have been defending well recently. With Fafa Picault and David Accam likely making the start again, the two strikers will have to get behind L.A.’s lines as soon as the Union win possession. Look for Kai Wagner to continue his brilliant play up the left wing as well to stretch the Galaxy’s defense and create space for Marco Fabian in the middle. Brenden Aaronson vs. Sebastian Lletget. Lletget can create from the back, and it will often fall to Aaronson to nip that build up play in the bud. Conversely, Aaronson has proven that he can be a threat up top. Lletget’s roll on defense is to provide a buffer in front of his back line. It will be interesting to see if the young midfielder can break down the USMNT vet. Fafa Picault. Picault hasn’t scored yet, which makes the difference between his goals scored and xG stats enormous. This has to be the one. Right? Zlatan has scored in every match he has played thus far. I don’t see this match as being any different. This will be the match where Fafa Picault breaks his scoreless streak, but it won’t be enough. gonna say if we get a result it furthers the Curtin turnaround mythos. if we find a way to win it’s gonna be hard to argue against it. I think the way to stop Zlatan is to stop his teammates. When starved of service he usually drops into the midfield to find the ball. Better his touches come 40yrds from goal and not in the box. The concern is if the diamond plays too narrow, the LA wings will be able to provide frequent service into the box. It would be a game I might be tempted to bring back the 4-2-3-1 myself but if Curtin sticks with the 4-4-2, I’d expect we’ll see Monteiro’s first start. Maybe Burke for Fafa too after last game.